Rarotonga rugby league got under way on Saturday with a two day pre-season seven-a-side tournament. Eight teams in two pools of four battled it out for bragging rights; two each from Avatiu, Arorangi and Ngatangiia plus Titikaveka Bulldogs and Takuvaine Warriors. Day one was held at the recently upgraded Avatiu Swamp but the finals were moved to Ngatangiia so the Avatiu field wouldn’t get too cut up. Although the rain stopped on Saturday afternoon I was expecting plenty of mud and puddles – makes for interesting pictures! But Nukupere Park, the Ngatangiia sports ground, was firm and dry, not a puddle in sight. Must be because it’s just about on Muri beach, very sandy soil so the rain drains away rapidly. A lot of younger players were strutting their stuff, no doubt hoping to catch the eye of selectors for the mini games in September. The season proper gets going on February 6 and will include a team from Aitutaki, the Sharks. We’ve just returned from Auckland. It was raining when we left, so much so that Air New Zealand provided large black umbrellas to keep passengers dry crossing the tarmac with ground staff to ferry the brollies back. It’s been raining ever since we got back but Auckland was fine. It was fine, it was fine, it was fine … for a while. We were there for the Leonard Cohen concert at the Vector Arena along with over 12,000 other people. Grey-haired heads predominated, hardly surprising as many of the audience must have been fans since Cohen first started in the late sixties or early seventies. The surprising thing was the number of younger people present. They would have reduced the average age of the audience to about 60. Cohen’s 74 now and last did a concert tour fifteen years ago. This one was necessary because his accountant (make that former accountant) cheated him out of $5 million. We were all there to contribute to his new pension fund. It was amazing, fantastic, awesome … you just run out of superlatives to describe the event. The stage is at one end of the arena with two levels of tiered seating around the other three sides plus rows of floor seating. Two large screens flanked the stage and an area towards the rear of the floor housed a video mixing/editing set up. The sound was superb, the lighting great and the screens meant you could see close up views of all the performers. 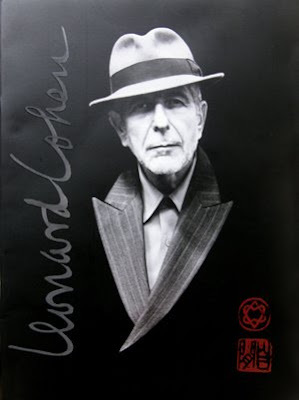 Leonard Cohen came bouncing onto the stage to a standing ovation and finally departed some three hours later after three encores and several more standing ovations. Mind you, the seats at the arena aren’t all that comfortable and, after a while, standing seemed like a good option. He sang old familiar songs, some with new arrangements, and the audience cheered and applauded as they recognised each one. He sang, played guitar, skipped, kneeled and squatted – for seventy-four-years-old his knees are in great condition! The band and backing singers, the Unified Heart Touring Company, were all introduced at one time or another and all performed solos. It was a pleasure to hear them; these are highly skilled musicians in their own right. Cohen came across as a gentleman and it wasn’t just the fedora and suit. Quite a few clips of the concert have appeared on YouTube but most of them were taken using cell phones, you could see small bright squares of light bobbing about all over the arena – dreadful quality sound and vision. Here’s one reasonable clip taken from close to the stage on the left hand side. I’m hoping that somebody will put out an official DVD. It shouldn’t take long to produce because what was being shown on the screens at the concert was really very good. I’d buy a copy and so would a large number of those in the audience. It would all help to increase Cohen’s pension fund. We recently had some wet weather. Nothing like the floods in Fiji, eleven dead, thousands evacuated from their homes and many tourists stranded. The Cook Islands are usually much luckier with their weather and I hope that continues. But when we get heavy rain a lot of soil makes its way into the lagoon. The new stadium site in Nikao is a humungous source of loose dirt at the moment and the muddy water flows via various ditches and culverts into the airport drainage channel and then straight into the lagoon at the sea wall. But it’s not the only one. The Takuvaine stream outflow by Trader Jacks at Avarua harbour is another waterway that looks like liquid mud in rainy weather. The soil probably comes from taro patches and fields further inland but really heavy weather yields a bumper crop of plastic bottles and other rubbish. Still, that’s better than Muri lagoon where the Titikaveka pig farms are still dumping pig poo into streams which feed straight into the lagoon. At least Nikao dirt is clean dirt! As you can see from the video, fine weather and a high tide or two soon clear the surface mud away but the lagoon is fairly shallow and not very pretty for the most part. That’s probably an effect of all the run-off over the years. It’s a problem that the environment service is aware of. They used to run adverts warning people that mud in the lagoons kills off coral, but it’s difficult to know what they can do about it. Never mind that the hospital has advised people to drive carefully and not have accidents because the island’s sole anaesthetist is sick - the mini games is where it’s all happening. Or not as the case may be. David Lobb is a well-respected sportsman and organiser who has been involved participating in and running some of the major events that have been hosted in the Cook Islands over the years. As CEO of the games organising committee he gave a statement to the media concerning lack of communication with and lack of action by the games board. He was promptly dumped. The games board is made up of four politicians and two department heads who are considered to be arrogant and incompetent by many people. There are a few other hangers on but generally speaking you wouldn’t expect the board to organise its way out of a paper bag let alone run a major sporting event. Three codes threatened to pull out of the games. One of them, tennis, has now done so but it’s no great loss. Athletics and weightlifting are the other two and that is far more serious; our best young athlete is Sam Pera junior and it would be a real shame if we couldn’t get to see the lad in action; and without athletics there would really be no point in holding a mini games, even though we haven’t got any world beating athletes. Any way, you can read all about it on the Cook Islands News website. In the end everything will get sorted out, the games will go ahead and be a great event but honestly it would have been better to keep David Lobb and dump the games board. The video shows how the indoor stadium is coming along. There was a long delay waiting for equipment to arrive on the boat and we’ve just had some rough weather which will hold things up again, but I’m sure it will be finished in time for everything. If you’re interested in the Cook Islands and what’s going on here, download and print this free pdf year planner and keep track of all that’s happening this year. As well as the usual sporting events like the international triathlon, round Rarotonga road race and vaka eiva canoe festival, this year we have the Pacific mini games – assuming all the controversy is sorted out and the games go ahead – the world youth netball championships, a mini golden oldies rugby festival and the Cook Islands games where outer islanders have the chance to compete against their Rarotonga brothers and sisters for the chance to represent the country at the mini games. There may be a rugby 15s tournament for the eastern zone of the the Oceania Cup. This includes the Cooks, Niue and Tahiti but dates are yet to be confirmed as the tournament was originally scheduled to take place in Niue. On the culture front the composers’ competition, dancer of the year, Maeva Nui culture festival and tiare flower festival are all on the calendar. It should be another action packed twelve months. The year planner is A3 size so if you have an A4 printer make sure you set it to ‘fit to paper’ or the equivalent. Two thousand and nine got off to a quiet start on Rarotonga. The weather was fine and no doubt there were plenty of people out and about counting down 2008, but I wasn’t one of them. The police have had a high profile over the holiday period, targetting drunk drivers, underage drinkers and troublemakers in bars and nightclubs. It seems to have worked over Christmas with only a few accidents, one fight in town and a couple of noisy parties reported. In Nikao at midnight, as the old year ended and the new one began, there were no shotgun blasts, no fireworks and no cars honking their horns. Come to think of it I didn’t hear many cars at all. And on New Year’s Day in Avarua there were no signs of broken glass, smashed bottles or empty cans. A peaceful start to the year. The Cooks received four Queen’s New Year Honours awards. Marjorie Crocombe, one of the first CI graduates from the University of the South Pacific, got an OBE for services to the Pacific and Cook Islands in education and literature; Tutai Toru, former long time head of immigration and a stalwart of Avatiu sports club, got an MBE for services to the public and sport; Tom Wichman was awarded a BEM for services to the community and scientific inventions. Tom has been promoting alternative energy sources in the Cooks for many years. Justice of the peace Pae Tuteru also received a BEM for services to the public and church. Amazingly there were no politicians on the list! Mind you the pols always keep the KBEs for themselves and presumably there’s a limit to the frequency they can give one or other of themselves a knighthood. Congratulations to Marje, Tom, Tutai and Pae. Let’s hope the rest of the year is full of more glad tidings.